Does the situation where British people are dictated to by a group of people that they have not elected, nor have any democratic way of removing, sound familiar? In the eighteenth century, this was the reality for people living in the Thirteen Colonies of America. More than one hundred years after the first British settlers had arrived in America in 1620, they had come to regard themselves as American both geographically and culturally, but, many still considered themselves as British in both a legal and political sense, and Britain did of course still have legal and political influence over the colonies. By 1776 the people of the Thirteen Colonies had managed to break free from the control of Britain so as to make their own way in the World, which on balance doesn’t seem to have turned out too badly for them! It is often argued that the full separation of the American colonies from Britain was inevitable. In part this was thought to be due to the adventurous and risk taking nature of the people that first went over and settled there. These pioneers undertook a perilous journey across the Atlantic, to a land unknown to them. Subsequently, breaking the ties with Britain to ‘go it alone’ held no fear for them. The settlers were different to those they left behind in that they were generally farmers and craftsmen who did not share the values of the aristocracy or the labouring poor. This led to the establishment of a society that was not as hierarchical as England. The emigrants included many religious refugees who did not share the same religious views and practices of those in England. The American Colonies were arguably ruled by a Britain that was fundamentally different, and with the passing of time these differences grew as the colonies became established and evolved. This led to a drift further away from the values and culture of the ‘mother country’, possibly advancing the argument that separation was indeed inevitable. King George III and his ministers often shaped their empire through their policies, and some of these certainly antagonised the American Colonies. Historian P.D.G Thomas stated that in all likelihood, American independence was accelerated by up to fifty years due to inept ministers in Whitehall. After the accession of George III in 1760, the Archbishop of Canterbury wanted to impose Bishops on the Colonies churches. Prior to this the churches in the colonies had enjoyed free reign over their affairs. Although the colonists were antagonised by this, and although the original settlers in the American colonies included many escaping religious persecution and who wanted religious freedom, it is noteworthy that religion did not appear to be a major driver towards independence. Religion is absent in ‘The Declaration of Independence’. This was the statement that was drawn up chiefly by Thomas Jefferson and adopted by the Continental Congress on behalf of the thirteen United States of America on 4th July 1776. It was a statement by the American Colonies to Britain as to why independence was being declared. Although religion was excluded, it must still have been a motivating factor in the desire for independence. Given the background of many colonists, it must have been intolerable to have Bishops imposed on their Church who could exercise control over the religious practices of the colonies. The desire for independence was motivated in particular by the way that Britain imposed taxes within the British Empire. The defence and administration of the American colonies was expensive, and the British Government decided that the colonists should bear this expense rather than the tax payer in the ‘mother country’. March 1765 saw the Stamp Act passed that levied duty on legal documents including marriage licences, land grants, wills and even newspapers and playing cards. The cry of ‘no taxation without representation’ became increasingly common in the colonies. Prime Minister George Grenville disagreed with this assertion as he stated that the MPs from the ports that traded with the colonies were their representatives, but in reality these MPs were representing the British ports only, as they tended to be in competition with the ports of the colonies. In 1767, Chancellor Charles Townshend introduced taxation on commodities including glass, paper and tea. By 1770, Townshend had repealed the tax on commodities except for on tea. At this time, the British East India Company (EIC) was struggling to bear the vast expense for the administration of India. This led to the British Governments relaxation of the Navigation Act for EIC tea trade. The Navigation Act said that goods exported from the colonies had to be routed through Britain so that tax could be charged on goods. This requirement was lifted for EIC tea, which subsequently made American tea traders uncompetitive compared to the tea traders of the EIC. In the latter part of 1773 a protest group called the ‘Sons of Liberty’ had been able to successfully turn back EIC ships carrying tea destined for the American Colonies. The only colony where the tea shipments had got through was Massachusetts, where they managed to reach the Harbour of Boston. The colonists refused to let the tea be unloaded and tried to send the ships back. On 16th December 1773 the protest that was to become known as ‘The Boston Tea Party’ took place. 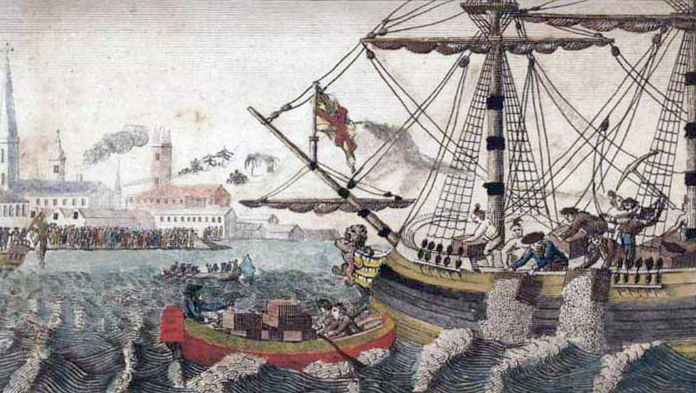 The ‘Sons of Liberty’ led a protest in which 342 chests of tea on board EIC ships in Boston Harbour and were worth £9,000 were thrown overboard. The British were quick to punish the perpetrators and to replace the Governor of Massachusetts so taking away their self-governing rights. There were a number of punitive laws passed to punish the colony such as the ‘Boston Port Act’ which closed down Boston Harbour until the EIC had been fully compensated for the destruction to its property. It was not just the imposition of unpopular taxation that infuriated the colonists. The British passed other legislation that the colonists disagreed with. An example of this was ‘The Proclamation of October 7th 1763’. This was drawn up by British ministers and presented to the American colony, to prohibit the western movement of the American Colonies. The British were keen to foster good relationships with the native Indians and not to take over their territory and risk an expensive war. It also meant that by restricting the colonists to the Eastern seaboard it made control of the colonies easier. Some colonists resented the proclamation, particularly ones that had already started moving out to, and investing in, the West. Historian Marc Ferro states that the proclamation “was detrimental to the interests of the capitalist and speculative promoters like the planter George Washington or even Benjamin Franklin”, who were of course to become two of the founding fathers. There were sometimes good reason for the British wanting to control the colonists, for example their relationship with the Native Americans. Historian David Day describes the massacre that occurred in Virginia, where a mutually beneficial relationship initially built on trade between the Colonists and the indigenous Powhatan Indians quickly disintegrated. This was due to increasingly violent clashes over competition for reducing resources, and within two years of the colonists’ arrival it was to reach its conclusion. In 1622 the English killed an Indian leader which provoked the Powhatan Indians to kill around a third of the English. The English response was to deliberately exterminate the Powhatan Indians and destroy their habitat and means of livelihood. Some argue that slavery was also a driver behind the desire for American independence. The colonies, particularly in the south, wanted to continue with slavery and the slave trade. There was a growing abolitionist movement in Britain, and only four years before independence in 1772, the case of the slave James Somerset was heard in Britain where he was subsequently freed. This precedent led to some slaves in Massachusetts going to court to attempt to obtain their freedom due to their residency in a British colony. For the colonists that benefitted from slavery this was a massive threat to the continuation of their lucrative livelihood, and so they wanted to stop the spread of the abolitionist movement in the colonies. A key element of a democracy is that its people are involved in making decisions about its affairs, primarily through the right to vote. The undemocratic and unaccountable nature of the EU is one of its many flaws with its unelected commissioners and bureaucrats. One of Tony Benn’s tests of democracy was to ask “how can we get rid of you?” So if we were to ask “How can we the people get rid of the EU president Jean-Claude Juncker?” the answer would be that we cannot. The EU fails this simple test of democracy. Therefore, is there a valid argument to suggest that the British influence over the Thirteen Colonies was undemocratic similar to the EUs influence over the UK is? Do those that wish to leave the EU follow in the spirit of the British colonists in America? Is the way that the EU restricts the UK’s business environment similar to the way the British treated the Colonists, for example the restriction of westward movement of the colonists? Is the potential of future rules that the EU are likely to impose on the UK comparable to the fears of the Colonists and their concerns at the prospect of Britain ending slavery and the slave trade (disregarding the moral arguments on slavery which is a separate debate)? EU & EEU – C’est pire qu’un crime, c’est une faute! Press briefing with Sean Spicer 6.30 pm.